This recipe is so easy. All you do is zest an orange, grind some whole cardamom (or...if you're really needing to push the easy button I guess you can use pre-ground...*sigh*) and dump them with a cup of ground coffee in some water. Then wait 12 hours. That's it. Then, plunge, chill, pour over ice and add cream or sugar if you wish. When I came across this recipe a few summers ago and imagined what the outcome would taste like, I was instantly transported back in time to my blissful days overseas. I sought out every possible opportunity to indulge in a plethora of flavor combinations unique to the various people groups who comprise the mosaic of Israeli culture. Morocco, Iran, and Turkey each hold a special place in the "Eastern" or Mizrachi sector of Israeli society. The pungent flavors of spices such as cardamom, clove and cinnamon marry within so many edibles, be they roasted meats, rice, vegetables, hot drinks, or desserts. Dried, sugared citrus peels stud many a dish, and were among my regular purchases during my open-air market visits in Jerusalem and Tel Aviv. Turkish coffee brewed in a finjan. 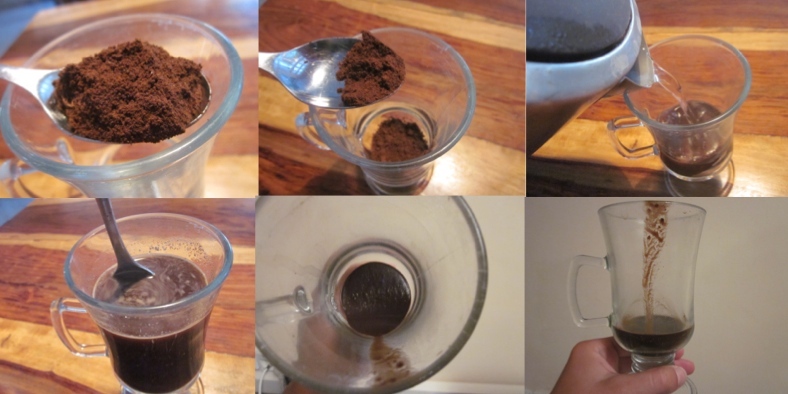 In any case - rather than the traditional, tedious Turkish method (bring to an almost-boil in a finjan, rest, repeat), most Israelis make a shortcut for their daily cup by scooping heaping spoonfuls of finely, finely, finely ground coffee in a cup, and adding boiling water. Stirring it vigorously and letting it rest for a few minutes allows the coffee grounds to sink to the bottom, leaving the coffee in the upper 3/4 of your cup. No filter. Just don't drink it to the dregs... Israelis call this version botz, meaning "mud," for good reason. What makes a coffee "Turkish" is not only the ultra-fine grind of the beans. The characteristic taste of the deep, dark coffee showcases the pungent, floral and pine-like taste of cardamom, or hel, as it's known in Hebrew, spiking the brew. Cardamom seeds and pods are added to the coffee beans in the grinder. And it is this exotic taste that instantly takes me back across the Atlantic. A coffee store in the Muslim quarter of Jerusalem's Old City market selling coffee with cardamom. Don't get me wrong - I loved the Israeli-Turkish quick coffee. I still crave it. But I really, really missed a decently brewed cup of coffee. Pour-overs hadn't made their journey East then (and probably still haven't yet). And... much to my chagrin in the sweltering Middle Eastern summer, the only available "iced coffee" I could find was disappointing, imitation-frappuccino sugar bombs made from a powdered mix. So - here's my way of having the best of both worlds: exotic citrus and spice flavors featured in a properly brewed, smooth, bold, cold-press coffee. It's really just 3 ingredients and water. You'll need to grind your cardamom seeds either in a mortar and pestle, or the coffee grinder. I recommend getting the seeds versus the green pods so you don't have to split them open. Click through the gallery below to watch the process. P.S. : For those of you oily people out there who are wondering if there's a hack... there is! I actually prefer the spices and orange zest route, but there's nothing wrong with shortcuts if they're health-ful, right? Sub 1 drop of Young Living Orange or Tangerine oil, and 1 toothpick-dip from your Young Living Cardamom oil, swirled into the coffee (after adding the water right after step #3) for the citrusy-spiced flavor.